Snakeoil 0.1.4 onwards support Roonlab's RoonBridge. RoonBridge installation comes in the form of a script, as such your Snakeoil computer needs to be connected to the Internet for the installation to complete. Because of the scripting nature, RoonBridge comes in the form of a Snakeoil module. 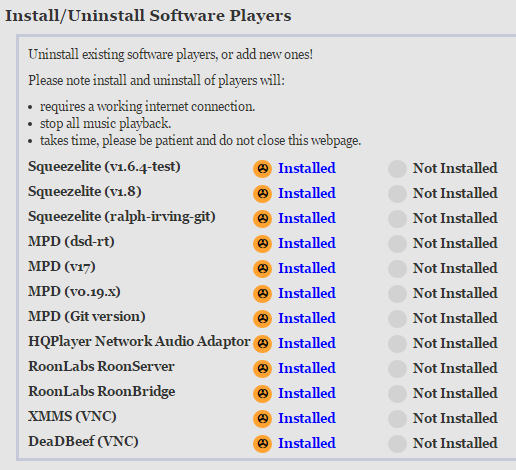 Once installed, RoonBridge will automatically appear in the software player list. Click on the Pick Firmware File button, a file dialog would pop up. Go to the download folder and select the module downloaded in Step 1. then click the Ok button. Verify you have selected the right file by looking at the Firmware text box. The pop up dialog should disappear. Click the Upgrade System button. Wait for installation to finish, be patient as the time taken will depend on your Internet speed. RoonBridge is now installed, you can click the back button to return to the Snakeoil web interface. Now the next time you are in the Software tab, the RoonLabs RoonBridge player should appear in the player list (2nd from last in following example). If you have the activated your Snakeoil OS. 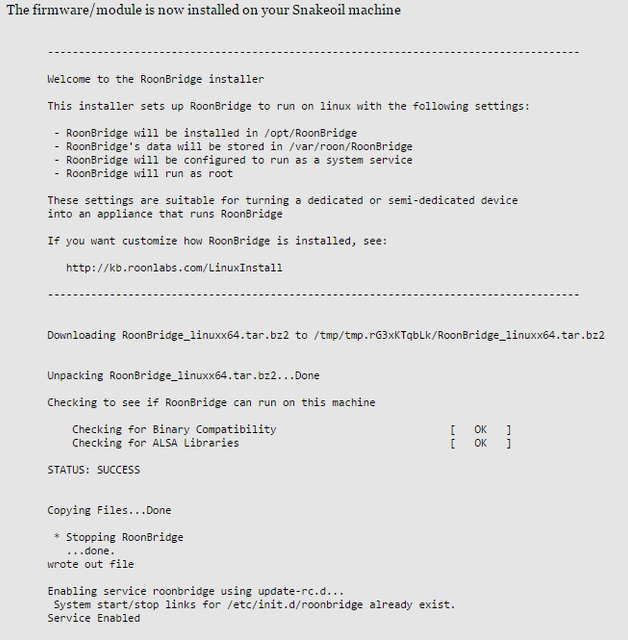 Installing RoonBridge has never been easier when you updated the firware to 0.1.5-pre-release-20160904. Just go to the snakeoil tab and Click on the Install radio button right next to the RoonBridge entry and click Save. To uninstall simply click the Not Installed button and click Save. All from the click of the web application. No need to worry about how to SSH in, or learn Linux commands.